We've all heard of the musical 'Wicked'. Hitting Broadway theatres in 2003, 'Wicked' tells the story of the two witches from 'The Wizard of Oz' describing how they first meet in the Land of Oz and their unlikely friendship that forms. Since hitting Broadway, 'Wicked' has been performed over 10,000 times, surpassing 'Phantom Of The Opera' and making it one of the most popular musicals the world has ever seen - And it's coming to the Gold Coast! Produced by Matt Ward, the Gold Coast's production stars seasoned performer Samantha Dodemaide as Elphaba, the Wicked Witch of the West, and Gold Coast local girl Emily Monsma as Glinda the Good Witch. 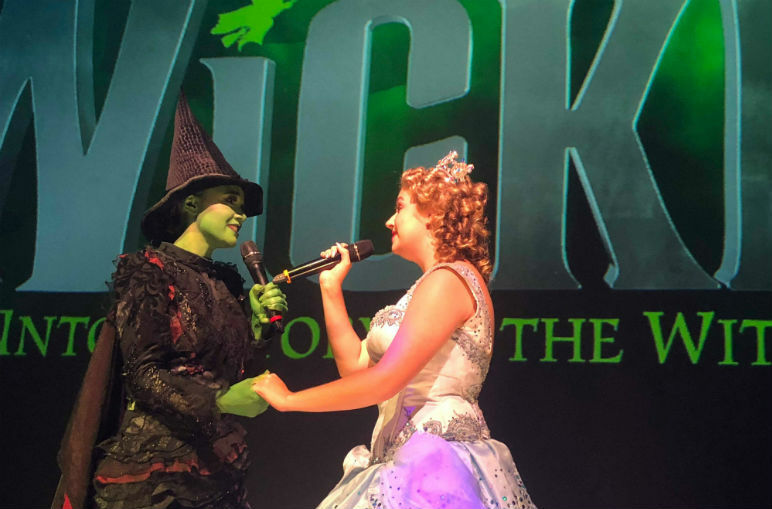 Joining a talented cast and crew for nine days of performances in June and July, Samantha and Emily's talent, experience and friendship helps to take 'Wicked' to a whole other level - And we got a chance to catch up with them before the show starts! You've both been performing in theatre for quite a while now - How long have you been performing for? Samantha - It's been about ten years now - So quite a while! Emily - I've been performing ever since I was little! My first performance was actually a production of Annie at the Home of the Arts in 2005 - I was ten years old when I did that, and I've been performing ever since! You've both obviously got a fair bit of experience in musical theatre, having performed in The Wizard of Oz previously and currently being involved in the production of 'Evita' - What do you love so much about 'Wicked'? Emily - I think my favourite thing about Wicked is the bond of sistership between Glinda (myself) and Elphaba (Samantha). The Wizard of Oz is such a feel-good movie and it was my favourite movie when I was growing up, so I'm really excited to be performing in Wicked now! The bond between the two witches is so unique - It's something really special. What would you say is your favourite song in the musical? Samantha - It would have to be the Wizard & I or As Long As You're Mine. As Long As You're Mine is a love song between Elphaba and Fiyero, and I really love the romance behind it. I think everyone is a sucker for love songs. Emily - Oh, my absolute favourite is Popular - It's my jam! I really love it, I've been singing it since I was little! I really love singing Food Good as well. Performing in musical theatre obviously means that you have to travel quite a bit sometimes. Where has been your favourite place to visit so far? Samantha - I've been traveling quite a bit in my time - I've performed in Japan and I've been to Europe and Singapore, but my favourite country has to be Australia. I've got all of my family back home here, and it's always nice to come back to them after being away. Emily - My favourite place is the Gold Coast as well - My partner lives here, and I was born and raised here as well - But otherwise I really love Adelaide! You've grown up on the Gold Coast Emily - Where is your favourite place to eat, drink and relax on the Gold Coast? Emily - I've grown up near Burleigh Heads, so my absolute favourite place to go is James Street! There's so much good food and shopping there - I could just walk down that street and eat everything there! Using three words, how would you describe yourself? Samantha - Try. Hard. Funny! I like to think I'm really funny, but I'm probably trying a bit too hard sometimes! Emily - Oh, that's a hard question... Probably fun, fun, fun! If you could choose to be any animal, what would you be and why? Samantha - I would be a cat - Any type of cat. Lion, Tiger, Cheetah, I'd be one of those. I'm just a huge animal person. Emily - I would be a flamingo. They're tall, lean, fabulous... And pink! And I'd be able to stand on one leg all the time, which would be pretty cool! Have you got any particular party tricks? Samantha - The last time I told someone this they tried to make me do it, but I'm actually not that bad at rapping. My friends always try and get me to make a rap and turn it into a classical song - I'm not very good at it but it's pretty funny! Emily - My partner likes to tell me I'm a pretty good rapper as well! I don't believe him, but I'll give it a go... But if anyone asks me about it I'll deny that I can do it! Does 2019 have anything exciting in store for you? Samantha - Well I'm still performing in Evita at the moment, which is due to finish up in a couple of weeks. After that I'm hoping to have a bit of a break and go tour Far North Queensland in a Diva Tribute Show, and then I'll be in something else at the end of the year... But I can't tell you that part just yet! Emily - 2019 is very exciting - I'm performing in Wicked in June! I'm also hoping to fit in a holiday at some stage. I don't know when yet, but I'd love a holiday at some point this year! Do you have any advice for people trying to join the performance industry? Both - If you love it - Just do it! If it's something you're really passionate about you'll just know. You have to work hard to keep the passion alive, but if you work hard for it and take the steps to get there, then you can totally achieve anything!